Last week, I knit the first instep. But no matter which heel I try (third one so far), they won’t fit. Augh! I need to rip them back and try more gusset increases. Not now though. They need to stay out of sight for a while. Unfortunately, I messed up: I forgot to knit plain the alternate rounds. Oof! At that point, I dropped everything and just went to bed. Today, it occurred to me that I might have cursed myself by frogging my Mad Cows and moving on to new projects immediately. 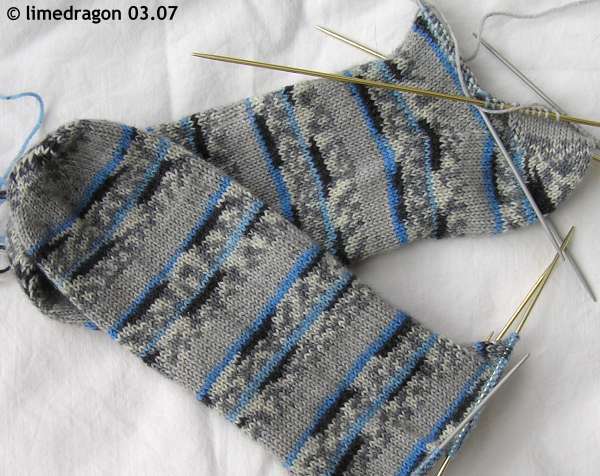 In the past, when I’ve knit socks, I always finished them, always. If I didn’t like them or they didn’t fit, I gave them away. I recalled the yarn Louise sent when I won her contest,* so I decided to knit raspberry and tweed Mad Cows. Good idea, right? 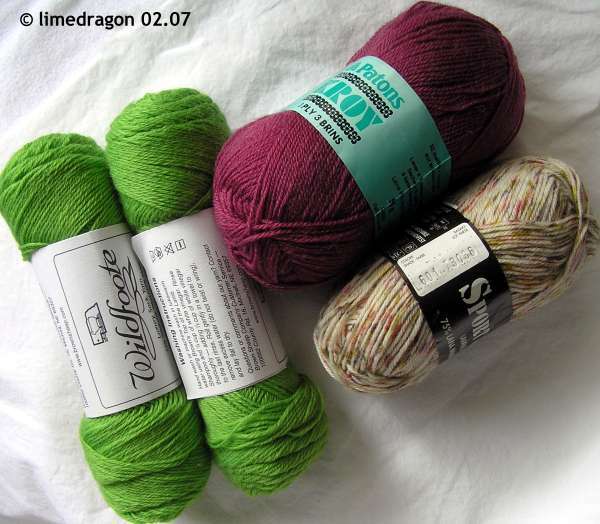 Uh oh, one teeny problem: the vintage Patons Kroy is much thinner and loosely plied than the current sportweight Kroy. The tweed yarn is more similar to the newer Kroy so I put it aside for another project. After stash-diving, I came up with a lone, blue skein of Henry’s Attic Kona Superwash sent by Jenifer (from Sock Wars). *Here are the yarns I’m talking about. I figured it would be easier to show them here again, rather than linking and making you go look at different posts. :) As usual, click for bigger. Yes, they do look like boysenberry sorbet and raspberry icee. Have you tried short row heels? I recently fell in love with afterthought heels. wow, i love the color combos you ended up with. fab! What a perfect yarn for Project Spectrum! I have to admit, I’m really ready to move into a new color group. The white and gray part are just a bit blah for me. 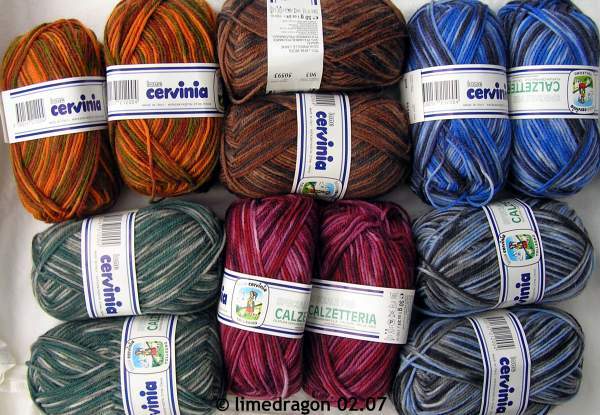 The Cervina yarn looks great. Deep colors. I think you purchased it at Borealis, right? 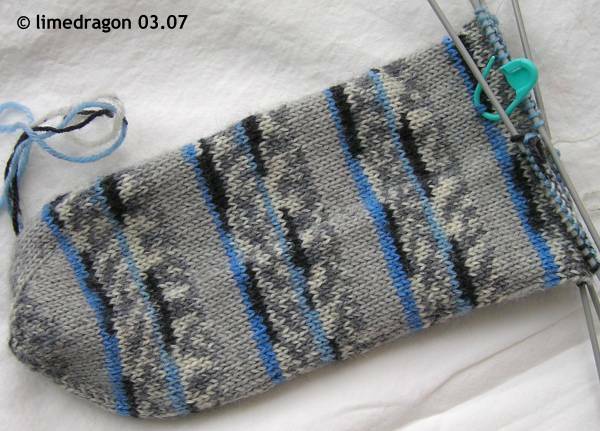 I’ve never done a toe-up sock so I can’t be certain how to make your heel fit better. Sounds like you have a high instep, perhaps you need to do some increasing before moving to the heel? I love your Project Spectrum socks. So crisp and icy. Hey — I know I’m too late to get in on the action — but happy blogiversary to ya! :) I’ve been happily wearing those awesome limedragon socks you sent me last fall this winter … Happy spring to you! Hey – I like the new mad cows – those are awesome colors. I like the intensity of the hues.